I have always believed you can learn something new from anybody. This could not be more true than in “MasterChef Junior,” where 8-13 year-olds create restaurant-quality dishes in a competition judged by popular professionals: Chef Gordon Ramsay, restaurateur/winemaker Joe Bastianich and Chef Graham Elliot. The entertainment value is high and heartwarming, while the ability of these kids never cease to amaze and inspire me. A nationwide search found 25 young home cooks to compete on the MasterChef stage. And now there are two! 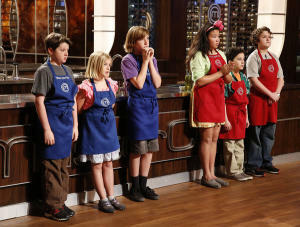 This Friday, November 8, on Fox at 8/7c, the first-ever Junior MasterChef will be crowned, along with a prize of $100,000. What makes this show so special? Simply, the kids. They are really just kids… with fantastically mature abilities to create culinary works of art. When Judge Bastianich tried to make Sarah feel better for dropping a pan on the floor with a cut of beef still on top and sharing that he believes in the 5-second rule, she whispered, “You do know you’re being recorded.” And when she didn’t move on to the top 4, I admittedly cried with a tearful Sarah. However, other favorites did move on, like lovable Hawaiian-shirt wearing 10-year-old Jack from East Rockaway, New York and hard-core 12-year-old Troy from Thousand Oaks, CA. But the one to beat is the composed 13-year-old Alexander from New York, NY. One of the judges noted about him, that he has a special relationship with food. He made liver (something he has never liked or worked with) into a beautifully rustic and savory masterpiece, moving him onto “another level” of culinary excellence. After trying Alexander’s creation, Ramsay jokingly offered him a job as assistant sous-chef at his restaurant in London. I wouldn’t be surprised if there was some truth to his offer; Alexander’s creativity knows no bounds. Whether taking over the kitchen of an upscale restaurant in LA, making aioli and macaroons by heart, or cooking with spaetzle or branzino (what is that? ), these kids teach me and my own kids, the possibilities when passions are pursued. Even more, watching these kids’ accomplishments, opens a discussion about excellence in whatever my children do, the hard work needed and the perseverance to keep on pressing on. If you know any amazing child chefs, sign them up here for the next season http://www.fox.com/masterchef-junior/ — then let me know you did!